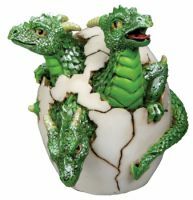 Roaring Gargoyle on a Spire Statue  - $22.99 : Mystic Crypt, the most unique, hard to find items at ghoulishly great prices! Roaring Gargoyle on a Spire Statue. Traditionally, gargoyles are both gothic accents on a building, as well as water spouts to help preserve structure and appearances. This Roaring Gargoyle on a Spire Statue breaks tradition, though, and hails back to the legends about this chimeric beast. The legends that evolved about these beasts painted them as sinister and terrifying beasts, whose sole purpose was to defend a building from evil. Thus, they were monstrous and powerful, but not necessarily cruel or malicious in intent. This particular beast perches atop a pyramidal spire, its powerful, bestial frame curled around the tip like a monstrous predator, ready to pounce. Its dragon-like tail wraps around the lower frame of the spire, while its great bat-like wings are held close to its back. The statue is crafted entirely in cold cast resin, and it is also hand painted, giving it a dark, carved stone look that echoes the style of these gargoyles in real life. 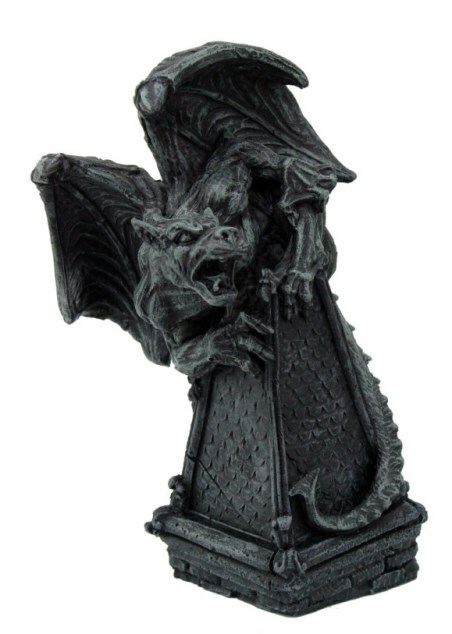 Fine detailing and a feral look makes this Roaring Gargoyle on a Spire Statue a stellar looking piece to own, as well as a striking decor piece that will leave others stunned whenever they see it. 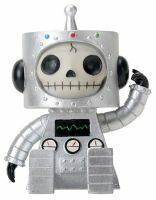 This figurine Measures: Height: 6" x Width: 3 1/4" x Depth: 4"